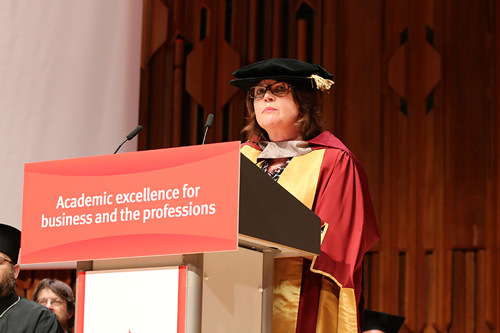 Caroline Alexander, Chief Nurse at Barts Health NHS Trust, has received an honorary Doctor of Science degree from City, University of London for her contributions to nursing and the School of Health Sciences. The ceremony took place on Wednesday 1 February at the Barbican Centre. After a highly successful period as NHS England’s Chief Nurse for London, in early 2016 Caroline was appointed as chief nurse at Barts Health NHS Trust, the largest NHS trust in England. Barts is a crucial partner of the university, both as a research partner and as a placement provider for nursing students, many of whom gain their practical experience there. Named in 2008 as a Florence Nightingale Leadership Scholar, in 2015 Caroline was named by the Nursing Times on their first-ever Nursing Times Leaders list which celebrates nurses and midwives who are pioneers, entrepreneurs and inspirational role models within their profession. Having graduated from Edinburgh University as a Registered General Nurse and with a Bachelor of Science in Nursing, from 1987 to 1993 Caroline specialised in nursing older people starting in the city where she studied, and then in London at Guy’s Hospital as a ward sister. In 1998 Caroline returned to the NHS and worked in Tower Hamlets in a range of roles within older people’s services. In 2005, Caroline took up her first Director post, as Director of Nursing and Therapies within Tower Hamlets PCT. With the clustering of PCTs in London in 2011, she took on the Director of Nursing and Quality within NHS East London and the City initially and then within NHS North East London when the clusters merged in 2012. Caroline was the Chief Nurse for NHS London for 6 months until she joined NHS England (London Region) as Chief Nurse. She was an Honorary Professor at City for three years until 2012 and is now a Visiting Professor at Bucks New University. “It is a great honour to receive this award from City, University of London. Over the years I have worked with my colleagues at City and seen how nursing has developed and grown at the institution. I look forward to continuing our relationship and seeing many more nursing students graduate from City at both Barts and other NHS institutions."